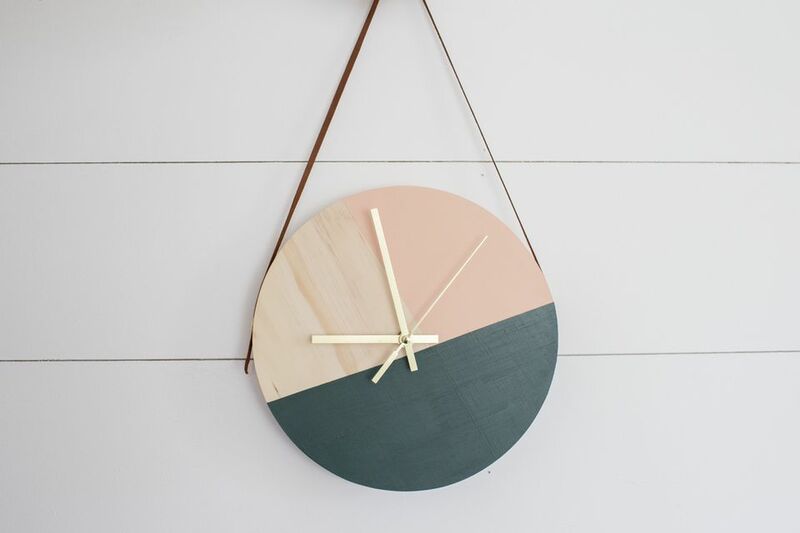 A modern wooden clock can be an interesting piece of wall art. It looks good on its own but it also looks good incorporated into a large gallery wall setting too. The only tough part is finding just the right style of clock that's simple enough to not be a distraction, but pretty enough that it fits in. The answer to this challenge is to make one yourself! 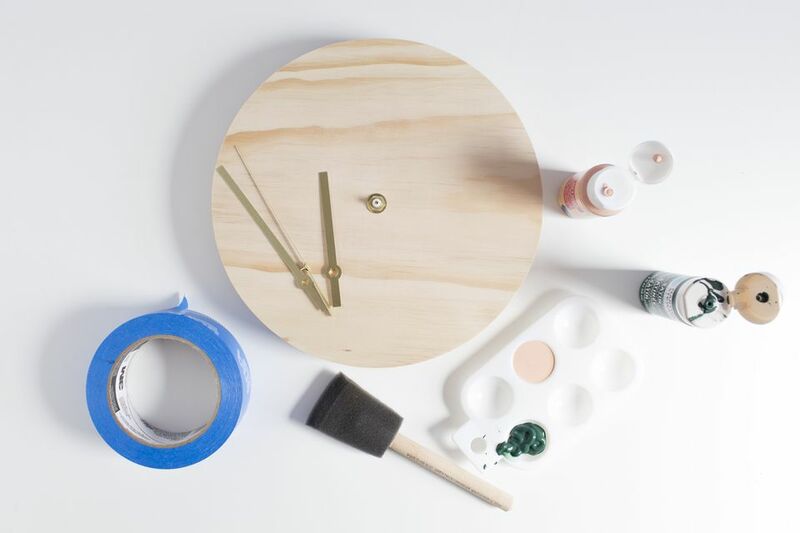 You won't believe how easy it is to make your own DIY clock. While you can use another prefabricated shape and buy a separate clock set-up, the version we suggest will save you so much time and energy. No need to drill holes, all you have to do with this one is attach the clock hands and add the batteries. Start by figuring out where you want your first hit of color, once you've figured it out, place a piece of painter's tape across the clock face. You'll want to place the edge of the tape where you want the color to end. Once you place the tape where you want it, use your thumb and run it across the edge to ensure that you've got a tight seal. This extra step can be the difference between a perfectly crisp line and one that has bleeds of color. It's also worth noting that while you can layer as many colors as you'd like, it's smart to start with the lightest color first. It makes it easier to cover the color than starting with the darkest color and needing many, many coats of a lighter hue. Before the paint dries completely you'll want to remove the painter's tape from the first section. If you wait till the paint is completely dried, it can pull up chunks of paint and ruin the edge. However, you do absolutely want to make sure that the coverage on the painted section is completely opaque. You need to leave the tape on until you've added all of the coats of paint. Let this first color dry completely before heading into the next step. Exactly like you did before, you'll want to figure out where you'd like your second color to sit on the clock face. Pay attention to the placement of the clock hands and where the hanger on the back will sit so you like the way the colors will look when its placed on the wall. Two coats of craft paint should do the trick here. Working with a foam brush will help minimize streaking in the paint when it's dried. Let the paint dry completely. While you can leave it at that and just hang your clock as is, if you want to add an extra level of detail you can add leather cording to hang your clock with. Decide where you want to place the tacks and then use them to affix the cording to each side of the clock. The tacks will work their way in with a small hammer, just watch your fingers! Add the hands of the clock to the face and you're all set. It's about time you had a clock this cool looking!